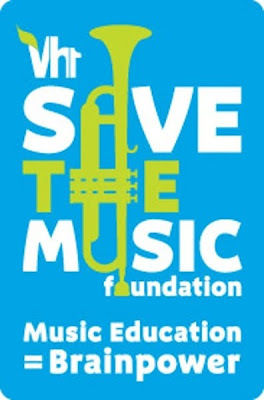 For the first time since it started restoring instrumental music programs in public elementary and middle schools in 1997, VH1's Save the Music Foundation is helping an entire state, West Virginia. The Save The Music program has a goal to help at least one school in all of West Virginia's 55 counties, then fully restore music education in other schools throughout the state. Thanks from all of us music lovers in West Virginia and beyond. You are my new favorite Lucinda (well...after Williams, that is).I've been reading your blog off and on this past week and have made it back to Nov 4th 2009. I am from Virginia, though have lived in California forever. Your sensibilities are so sympatico...your books, music, eras of interest, regional stance. lately, I've been draaming of moving back SOuth to live on a little piece of land...convincing my kids and their families is a bit of a problem though since they're dyed in the wool Northern Californians...but I keep trying. Reading you keeps me in touch with those parts of myself that find little fertile ground here CA. Found you through your comment on Peak of Chic. And scrolled down - I can't tell you how wonderful this is - music to my ears! I am a huge proponent of music education - so important for so many reasons!! I wonder if this organization haves facebook page.